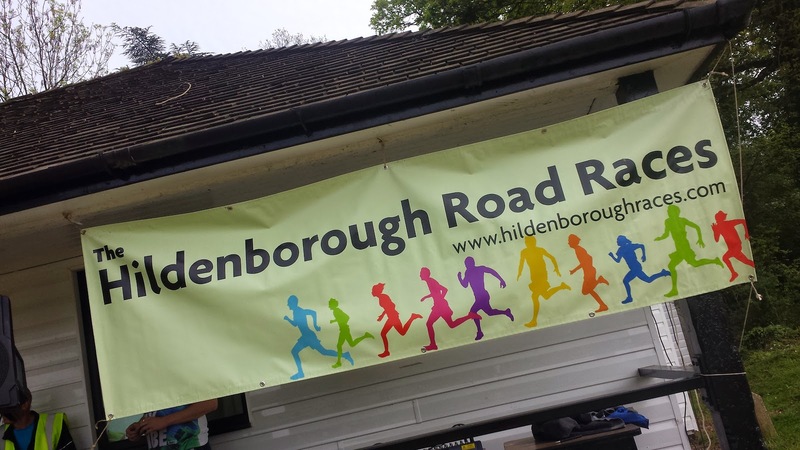 The Hildenborough road races are held on the first May bank holiday each year and have been a fixture in the local calendar for over 28 years. 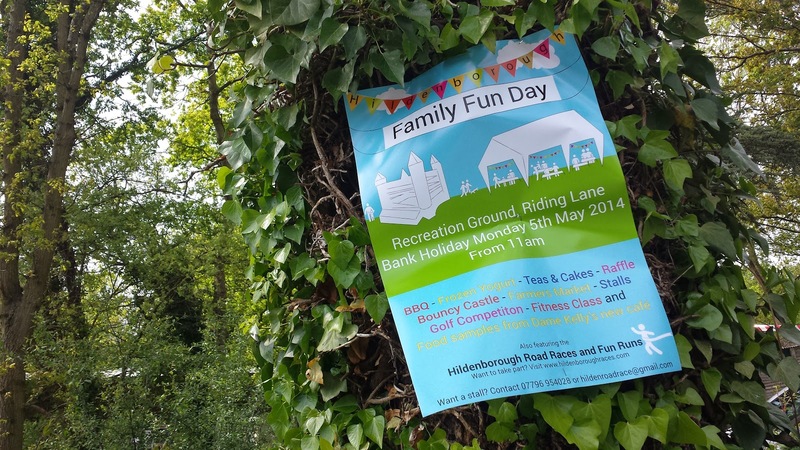 Although the races are the highlights of the day, there are many other reasons to go along to this family day out. For the first time in the history of the event, the organisers put on all kinds of fun things for the kids including a bouncy castle and a coconut shy. There were stalls and a barbeque and music. The recreation ground has a playground and a huge open grass playing field where you and the family can find a nice spot and have a picnic and sunbathe. It really is a great event. Before I go any further I'm going to get my grumbles and/or downsides out of the way. 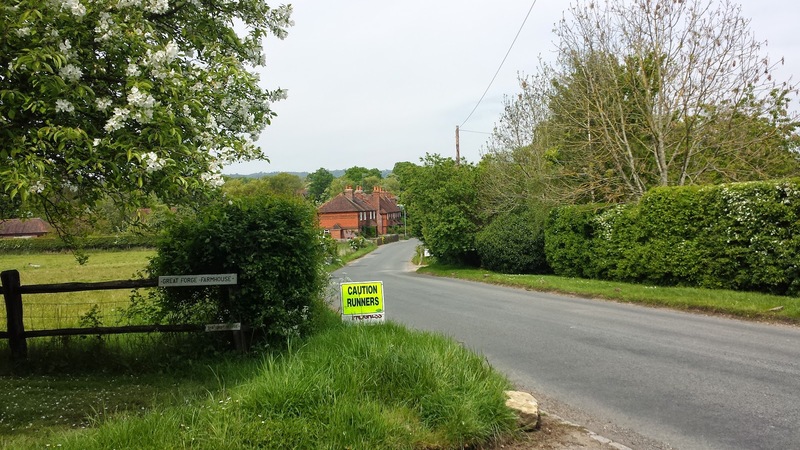 First the parking is fairly tricky in Hildenborough - the lanes are narrow and the car parks that do exist are tiny and full to the brim hours before the races are due to start. You will find a space somewhere, probably along Riding Lane, but it is tight. Secondly, I entered on the race on the day. Online the race was advertised as £9 for advance bookings but with an additional £2 for those that register on the day. So I was slightly surprised to find that I had to pay £12 on the day. And apart from the lights failing in the toilets just before the race, everything else was great! Car parked and registration fee paid, I went off for a 2 kilometre warm-up along part of the route. This is where I found out that the official description of the course being 'flat' was just a big fat lie! I'm not going to go as far as saying hilly because I know that it's uncool for runners to use this word, so let's just say that the course is undulating. Definitely not flat. It's not that I mind hills, in fact I really like them. It's just nice to know roughly what to expect in advance. I used to live in Tonbridge so I have run/cycled parts of the course before and suspected that they weren't flat in advance. 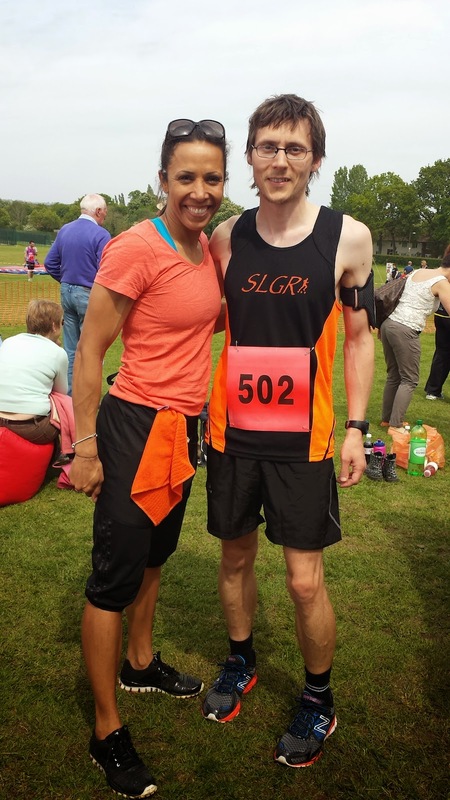 Being in Hildenborough, it was great to see the village's most famous sporting resident, Dame Kelly Holmes, lending her support. She had a stall showcasing some food from her forthcoming coffee shop and she started the races. She also presented the trophies at the end. I thought I'd be cheeky and ask to have a photo with her and I'm pleased to say that she was happy to oblige. So as I was chatting to @iandpullen (Ian's blog entry) and @diamondlitefoot before the race. I mentioned the undulations and we were unanimous in our feeling that this was definitely not going to be a pb course. As the races had a 2.30pm start time, we had all spent a little more time planning our lunch - I got mine in early and kept it fairly light. A few minutes before the races were due to start, we made our way across to the start line. The start and finish are within the recreation ground and are on grass. The rest of the route is run entirely on tarmac and pavements. I was here for the 10 mile race, but it wasn't the only race of the day. Earlier on there was a 1 mile race for under 11's which took place on a marked out course on the grass through the recreation ground. Now the main event was about to start and it wasn't just the 10 mile runners in the start funnel. There were also runners taking part in the 2.5 mile and 5 mile races. You can identify them by the colour of their race bibs. The 10 milers had a red background, 5 milers had a blue background and the 2.5 milers had a lighter blue background, which I imagine made things a lot easier for the marshals where the different length races divided. 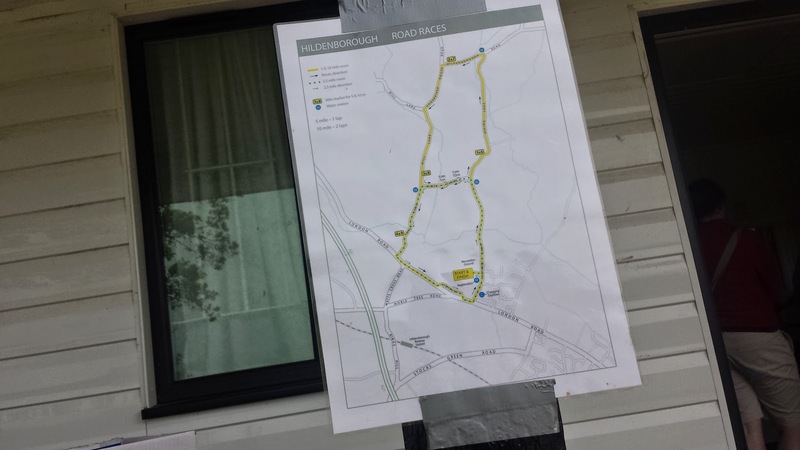 The route (official course map) was made up of one big 5ish mile loop around the quiet country lanes on the north side of the main road (B245) that runs from Sevenoaks to Tonbridge. I say a 5ish mile loop - but there is also an out-and-back section to run on each lap to make up the full distance. The turnaround point is different on each lap but there are of course marshals to advise where to turn. 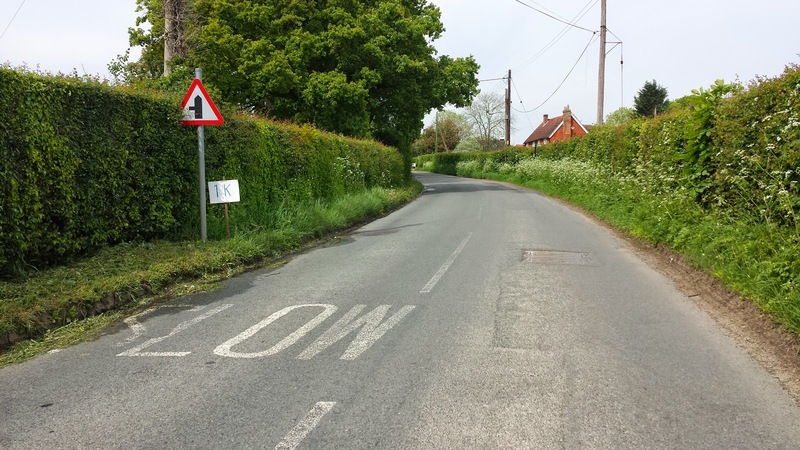 The course ventures onto the main road, but fortunately it has a pavement that the runners were able to run on. The 2.5 mile race stays on the main route for the first kilometre or so before turning off and doing its own thing. The 5 milers complete one full loop, while the 10 milers do two. My race plan consisted of going out fairly hard, but not too hard bearing in mind the undulations, I hit the first mile marker in about 6.25 and then just kept the pace going the best I could. I reached the 5k point in just under 20 minutes. Then at 32 minutes I reached the half-way point. Before starting the race, I had about 70 minutes in mind as a finishing time, after all I ran 66 minutes on a almost-flat course a few months earlier so it'd take me a little longer to get around with the undulations, right? The second half of the race panned out in the usual way for me - I focused on the runner ahead and slowly worked to catch up with them. Once passed, I looked for the next runner and tried to do the same. I think I actually hit the 10k point in just under 40 minutes. 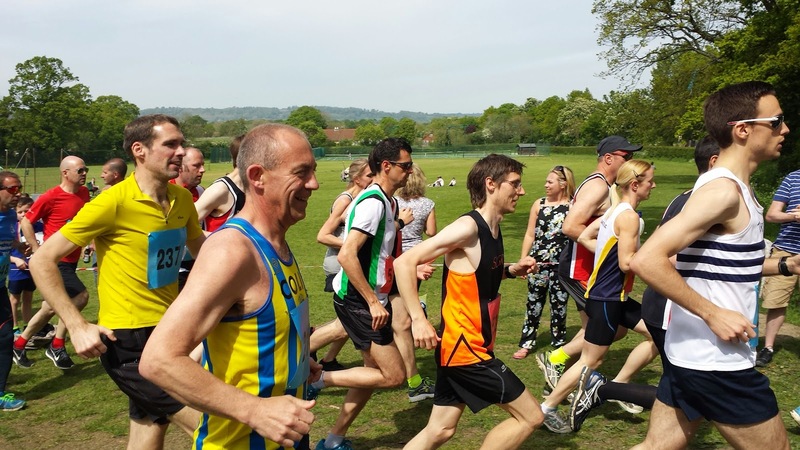 As I passed one runner he said 'well run, Steve' (or something like that) but it wasn't until afterwards that I realised that it was the Tonbridge parkrun event director, @alester229. 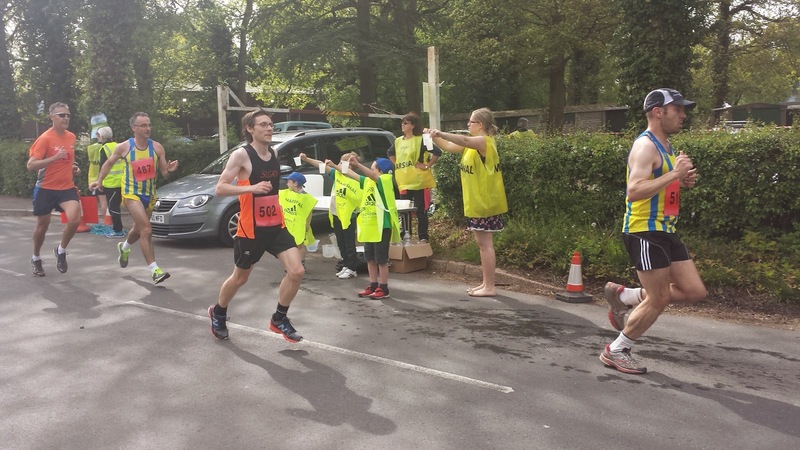 I plodded on, picking up a cup of water at every other water station - I think there were four in total, so there were eight opportunities for the 10 milers to hydrate which was brilliant because it was a warm and sunny afternoon. Finally at mile 8, the hard pace, the undulations and the previous water intake took its toll on me. My stomach started to hurt and running became more uncomfortable. My legs started to feel heavier and I felt like I was working a lot harder to maintain the pace. I had just overtaken a Dartford Road Runner and was closing in on another before this. However, I couldn't keep with the one in front and he ended up pulling away from me. Then I think the 15k point was reached in just a smidgen over the hour. I was relieved to finally arrive back at the recreation ground where, looking at the video above, I finished in quite a relaxed manner. The announcer had been notified of my arrival and it was nice to hear him call out my name and finishing position as I entered the recreation ground. 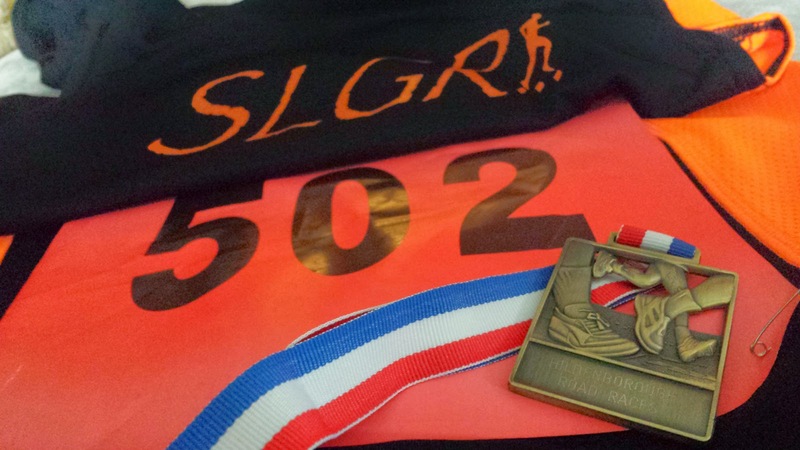 I crossed the line, collected my medal and continued to walk. Almost instantly I knew that I had pushed really hard as my quads began to ache. After a few minutes of walking, I switched back to jogging to have a proper cool down and did another 2 kilometres on the soft grass surface (I also wanted to round off the day's running to an even 20k). 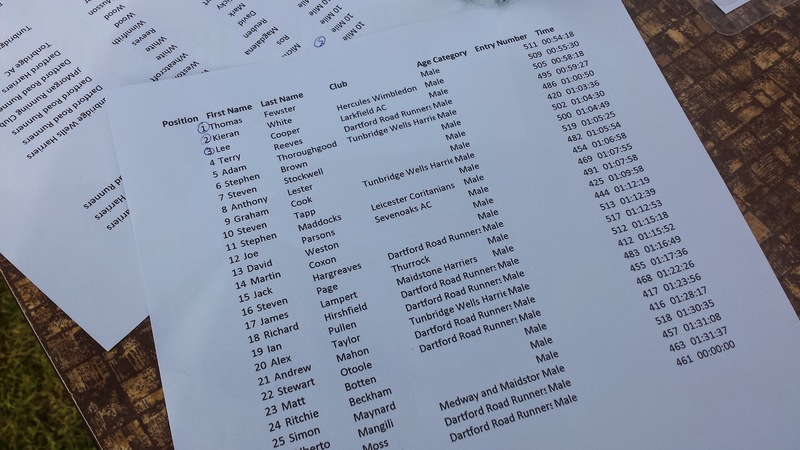 After watching the presentations, I had a sneak preview of the finishing times and I saw that I ran the course in 64-and-a-half minutes, which is a two-minute personal best. The full results can be accessed via this page and the official photos are here. What made the pb even better was that it was run on an undulating course. I suppose the aching quads were worth it for a pb! The only downside is that some other runners reported the course as being slightly short - my gps recorded 16km which is spot on. Just to reiterate, this a really nice, friendly family day out. The funny thing is, the whole time I lived in Tonbridge I didn't know about this race. It is a fairly low-key affair. I'm glad that I finally found it and I know exactly what to do if I find myself at a loose end on the first bank holiday in May!